Many years ago, when my eldest son turned five, we decided it was time for him to learn the value of money and how to handle it wisely. 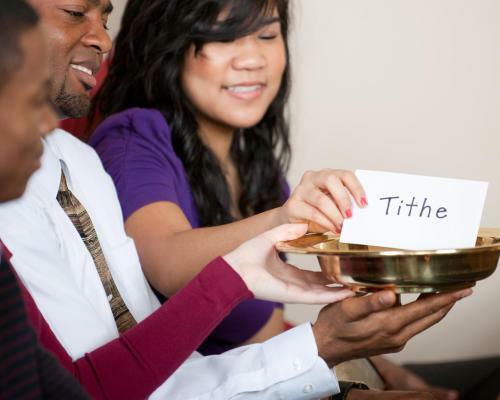 We gave him 10 cents a week, which would make it easy for him to learn the habit of returning tithe to the Lord. Many years ago, when my eldest son turned five, we decided it was time for him to learn the value of money and how to handle it wisely. We gave him 10 cents a week, which would make it easy for him to learn the habit of returning tithe to the Lord. I should remind you that 10 cents went a lot further in those days to buy treats for a little boy than it does now! When I gave him his first 10-cent coin, he wanted to save it and not spend any of it. I decided that when he had accumulated 10 10-cent coins, we could put aside one coin for God. He was delighted and ran off next door to visit an elderly neighbour and show her his wealth. She was a kind elderly lady and told him he needed a purse for his money, then promptly went inside and found him a little leather purse. He came home in high spirits and put it away in his drawer. When he had saved 70 cents, he decided to take his purse to the park behind our house to show his friends, who regularly played there with him. I warned him that it was not a good idea, as he may lose the purse or the money inside it. However, he assured me that this wouldn't happen and ran off to have a good time with his friends. When he came home an hour or so later very upset, I knew the reason. He had put his purse down by a tree while enjoying kicking a ball around with the boys. When he looked for it after the game, he couldn't find it anywhere. I returned to the park with him and, although we searched until dark, it was nowhere to be found. day, the council men mowed the grass in the park. The children loved to play in the newly mown grass so there was much fun and frolicking in the park that day. After a while, my boy came running home shouting with delight at the top of his voice. It was hard to believe but he had found his purse. Though a little wet and soggy, all 70 cents were still inside! Naturally, we thanked God for His watchfulness over His children and for teaching us a little more of His love and goodness. It had been a wonderful learning experience for our little boy, one that I know he has not forgotten to this day! He has been so greatly blessed throughout his life. Not even a sparrow, worth only half a penny, can fall to the ground without your Father knowing it. Matthew 10:19. Patricia Hunt lives in Auckland, New Zealand, where she teaches Bible as a volunteer in a local school.